In the previous entry we looked at the importance and logic of Creative Arlington. – Communicate that this is a crowdsourcing initiative where their ideas become manifested into built reality if they’re willing to become customers of their own creations. – Organize a meeting of the students (the more students, the more universities the better) to brainstorm the kinds of events, places and scenes they feel are missing, but should exist. – Establish the equivalent of groups or fan pages, just the same as you would on Facebook, but on the leadership entity’s crowdsourcing social network site, again, such as at Creative Arlington’s site. These groups would represent the prioritized projects from the previous phase. – Build a critical mass of ‘future customers’ by getting people to join the group. The leadership entity will work with the self-designated group leaders to find what that group size should be in order to attract what we refer to as the ‘sponsor’, a successful entrepreneur who shares the same vision as the group and feels a significant amount of risk is removed in starting such a business because it already has a loyal following (this is how chains and franchises work, by the way – see How local indies can compete with national chains. Future customers shall be rewarded. – Not only will the students establish a sense of community and camaraderie in the process, but they’ll have potentially helped develop a physical place to do so on a regular basis. Plus, they’ll then be able to carry their crowdsourcing influence into the kinds of events that are held there, especially given the bond that they’ll have with the business owner. – Since we’re talking real business and real community involvement here, it’s not only a real world, hands-on learning experience for the students, but their professors can help integrate the process into the curriculum, from design studio exercises to produce possible designs for the businesses, to playing ‘fantasy business’ and writing biz plans in business school. 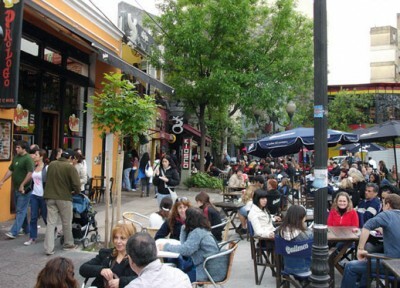 Photo of Serrano Square in Palermo, Buenos Aires, Argentina by Tyson Williams.